Librarian of Congress James Billington claimed Natasha Trethewey “consistently and dramatically expanded the power” of the role of U.S. Poet Laureate, holding office hours with the public, traveling the country, and reaching millions through her innovative PBS NewsHour segment “Where Poetry Lives.” Marilyn Nelson said “the wide scope of Trethewey’s interests and her adept handling of form have created an opus of classics both elegant and necessary.” With her selections and introductory essay for The Best American Poetry 2017, Trethewey highlights even more “elegant and necessary” poems and poets, adding to the national conversation of verse and its role in our culture. The Best American Poetry is not just another anthology; it serves as a guide to who’s who and what’s happening in American poetry and is an eagerly awaited publishing event each year. 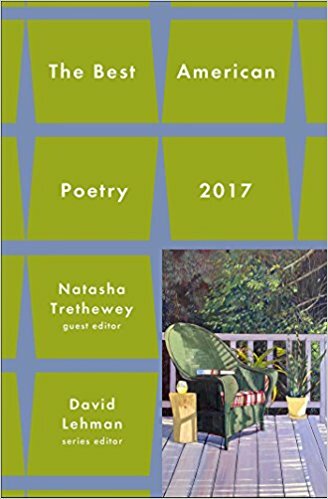 With Trethewey’s insightful touch and genius for plumbing the depths of history and personal experience to shape striking verse, The Best American Poetry 2017 is another brilliant addition to the series.